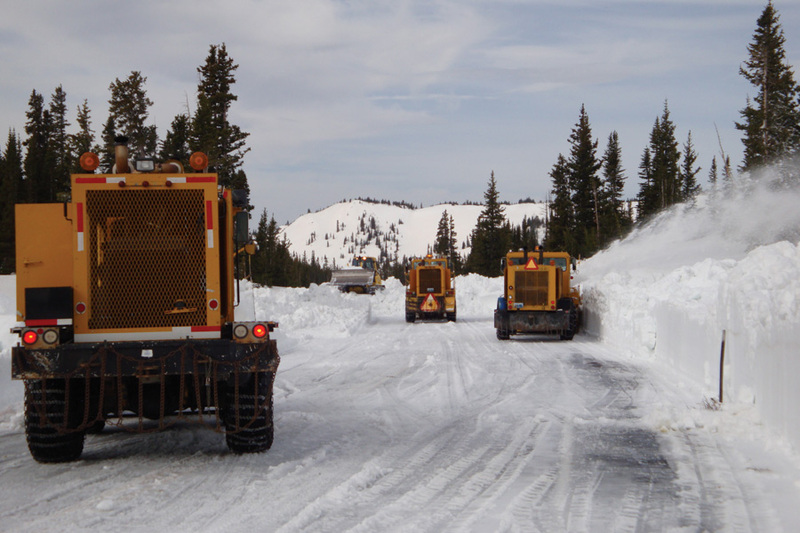 The Wyoming Travel Information Map shows users current road conditions, construction areas, and advisories. Known for its rugged beauty, Wyoming is a place where cowboys and wildlife still roam the plains. While the state’s population numbers just over a half a million people, millions visit each year to see Yellowstone National Park, Grand Teton National Park, and Devils Tower National Monument; go skiing, hiking, and fishing; and experience vast wilderness. With 6,800 miles of highway, Wyoming also serves as a major corridor for commercial truck traffic—particularly on Interstate 80, which runs through the southern part of the state. It is one of the busiest routes in the United States for moving freight from coast to coast. Truckers, tourists, and locals alike can now navigate Wyoming’s often unpredictable highways and byways with the help of real-time information from the Wyoming Travel Information Map, built by the Wyoming Department of Transportation (WYDOT) using Web AppBuilder for ArcGIS. On an average day, the map gets about 170,000 visits—and that number can climb to four million when there’s a big storm. WYDOT created the Wyoming Travel Information Map largely to help drivers plan their travel before they set out on the road. “Without this map, people coming from other states may not be well prepared,” added Garcia. The interactive map displays the state’s current road conditions, construction areas, and advisories. 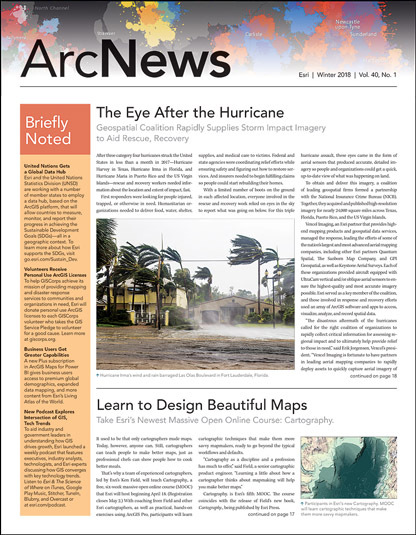 Other map layers include web cameras on certain parts of the highway, rest area locations, size and weight restrictions, weather stations, truck parking areas, and the locations of variable speed limit signs. 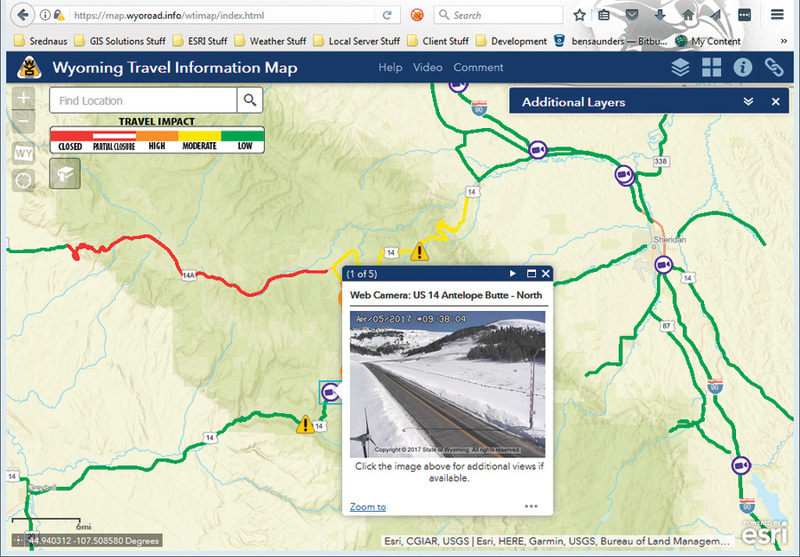 Users can turn on additional layers in the interactive map, such as web cameras on parts of Wyoming’s highways. With so many elements in one map, WYDOT didn’t want to have to build things from scratch. Although during development, WYDOT created several iterations of the map, the basic process of building it took just three days. After tuning up its performance, administering user testing, and working through network issues, the WYDOT team delivered the Wyoming Travel Information Map to the public within six months of conceiving the project. For more information about the Wyoming Travel Information Map and how it was built, email wyoroad@wyo.gov.